"Stick to wall, ground, human… then FFFFFRRRRRYYYYY! Hehehehehehehe." Anarchy is a Exotic Grenade launcher. 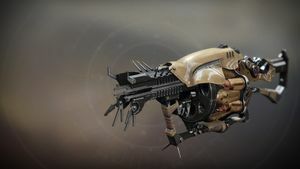 It can be acquired as a rare drop from the Scourge of the Past Raid. "You little rat. You took my warm hospitality and stomped all over it like an ungrateful child. Is that any way to treat one of your dear 'brethren'?" Siviks laughed. A cold, twisted laugh. Then offered up a large wad of spit at the Spider's feet. The Spider just rolled his eyes. "Let me know when you're ready to make nice," he said. Siviks' laugh now grew into something maniacal. He topped it off with another wad of spit, this time directly in the Spider's face. Once he'd wiped his brow, the Spider leaned forward, looking Siviks in the eyes, and said, "I think our little rat here needs a time out. Perhaps someplace with the rest of the vermin." The many hands of Spider's men gripped and restrained Siviks. As they dragged him off, he shouted, "You… as bad as all Fallen! Worse, even! A friend even to humans… All must die!" The Spider simply waved goodbye, taunting, "Bon voyage, my friend!" Once Siviks had gone, the Spider looked longingly toward where he had stood. He sighed a deep, regretful sigh before continuing with business as usual. Arc Traps: Grenades stick to surfaces and chain Arc bolts to other mines. Quick Launch: This weapon's barrel provides faster projectiles and much faster aiming. Greatly increases handling speed. Increases projectile speed. High-Velocity Rounds: This weapon's projectiles are particularly light and quick. Increases projectile speed. Increases reload speed. Moving Target: Increased movement speed and target acquisition when moving while aiming down sights. Composite Stock: This weapon has a versatile dual-purpose stock. Slightly increases stability. Slightly increases handling speed.